Carissa and Michael Alvarado are a match made in heaven. When their wedding vows went viral on the internet, it caught everyone’s attention including Oprah Winfrey! Now, this dynamic duo are touring the country with Ms. Winfrey as part of her “The Life You Want” Tour and their song “No Matter Where You Are” is being featuring in the upcoming animated feature “The Book of Life”. I sat down with Us the Duo to talk about the sudden path to success, being part of The Book of Life and rubbing shoulders with Oprah. “No Matter Where You Are” is a beautiful song and perfect for a wedding. I heard that this song is your wedding vows? Is this correct? Michael Alvarado: Lot of pressure too. CA: Big day, so we said, “Let’s just do it.” We did it and it was the first time we ever performed in front of family and friends. So you can just imagine the nerves. It’s like the nerves of your wedding day and the nerves of trying to get this song right. We surprised our family and they really enjoyed it. We put this video on YouTube and it kind of went viral and we don’t know why. It’s awesome! MA: We were just sharing it with our friends & family. The next thing you know our view count is up. Like, how did that even happened. I don’t know. Word of mouth goes viral. That’s beautiful. Tell us how you two met. I know that couples met in a variety of ways. What’s your story? MA: I grew up in North Carolina and Carissa grew up in Los Angeles. One day, m college roommate decided he wanted to move to L.A., live the dream, become an actor, but he needed a road trip partner and I volunteered. First time in L.A. I make it out there, big city big lights, amazing. I see on Twitter “Music Video extras needed. Tweet back if interested.” I was like, if interested, definitely! Sounded spontaneous while in L.A. I showed up at this house and there she is, standing in the middle of this group of people, also a music video extra. It was basically love at first sight. I mean, we talked, hit it off, and didn’t pay any attention to the video at all. The next thing you know, I’m on a plane the next day trying to figure out “What am I going to do to make this girl fall in love with me?” I spent the following six months tweeting her, obsessively. (Carissa laughs) Then, that turned into Facebook when things started getting serious. And then, we start face timing and she came around realizing she loved me as well. I packed my bags, moved to L.A. and asked her to marry me. You are now involved with “The Book of Life”. I saw the preview presentation of the movie during the summer. How did that happened? MA: Fox had one last scene of this movie uncompleted and it needed a song. An epic sort of love-filled song that could complete the scene and it’s a very climatic part of the movie. 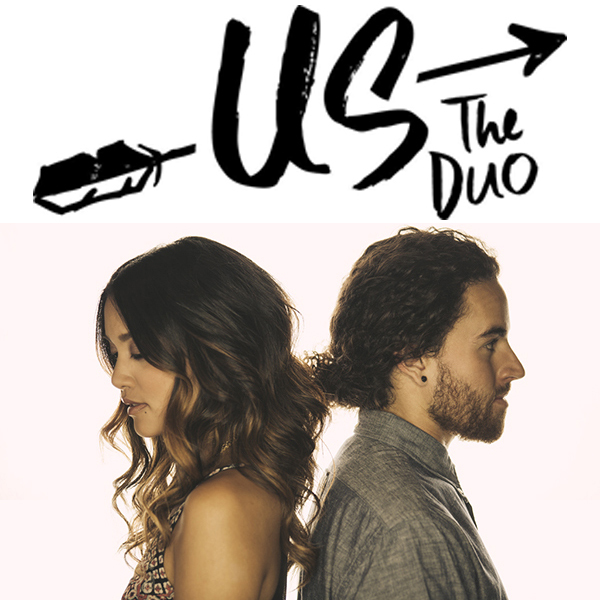 They turned to Republic Records, who is the label we’re on and said “We need a song that’s full of love and that can inspire people to want to love somebody else.” The Co-CEO said “I know just the people, Us the Duo.” Pitched them the song and they love it. They said, “Hey, Can you have Michael & Carissa come down to the Fox Lot Studios and let’s just meet with them. So, her and I don’t know what’s going on but we’re kind of freaking out because we always wanted to go to a movie lot. We show up and we’re meeting the Fox music team and they are the most creative, inspiring people. We’re playing our songs and it was just a match made in heaven. They told us the story of the movie, the characters and the journey of love. It was almost identical to our stories. We related to the movie and they saw that and thought that this song needs to be in the movie. Not only, it will be featured in the film but also the animation is going to match it. So they are going to have the characters sing our song, the actors are singing our song. CA: So Zoe Saldana is singing my part and Diego Luna is singing his part. Placido Domingo even makes a feature on it. MA: We’re like scratching our heads like “How did this happen?” and what started was this little wedding video on the Internet lead us to a Fox feature film. The story’s incredible and we’re happy to be in it. And now, it led you to OPRAH! I got to hear about… OPRAH. CA: As if the movie wasn’t enough. She saw the movie, screened it and fell in love with it. She heard about us and our song in the film and heard how we came to be. Then, she invited us to be on her tour, which is really exciting, and we got to hug her. We’re still freaking out about it. She smells great, in case you’re wondering. You’re performing in nine cities, DC being the third on the tour. You were just recently here not too long ago. Was this your first time in the DC area? CA: I’ve been to DC. Oh we actually had. CA: In eighth grade, a school field trip of course. We did that tour of the White House, all that good stuff. Then, we did come back to perform at a private event and that was our first time together coming out to DC. We got to explore that time around. So, I have to ask, what’s your favorite DC attraction? CA: That’s a great question. I love the Washington Monument. I got a picture. MA: And it sits on a mantle in the house. Let’s go back into your past. I would like to know your humble beginnings. How did you get started in music? CA: Well, I was actually a dancer before everything. At age five, I started doing ballet, tap, jazz and hip-hop. I was trained classically as a dancer first. Music started a little bit later. It started in church for my whole family was in the choir and they egged me on to join the children’s choir. Since then, I kind of fell in love with it. A funny story is that I was in my room one time. I was playing with my karaoke toy and I was quietly singing and started getting into it. Then brother overheard and called my family over and they were listening. So you can just imagine. When it was all over, my family cheered and applauded me. I was super embarrassed but then I thought that I should be doing this. They supported me and saw that I have a passion for singing. MA: For me, I started piano lessons when I was eight years old. I heard my sister playing and fell in love with it wondering, “What is this, I want to take that?” I think I wanted to quit maybe ten times throughout the process. It’s really hard as a kid, you know. Your friends make fun of you saying “You have to go inside and practice piano.” but my mom bribed me with Christmas presents and said you can quit and I’ll take away all your presents. CA: That’s a pretty harsh ultimatum. MA: I said let me think on that mama, I’ll get back to you. So I came back, I’m like 10 at this point and I’m like, you know what mom, I like presents; so I am going to to keep this piano thing but she saw something in me. I did piano for a long time and started playing keyboards in a high school band. We had a lead singer and suddenly he got sick and we had a gig. The band was like “Who’s going to sing this song?” I was like “I don’t know, I just play piano.” The band was like “Mike, you have to do it.” So, I get up on stage. I was freaking nervous, sweating and I sing this song. I was like “It’s not too bad and the people were jamming. Why don’t I just sing and play the piano?” It was a…. MA: A Match made in heaven, exactly. CA: Well being a dancer and enjoying singing, I really admire Beyoncé and Destiny’s Child. I was all into boy bands and girl groups. CA: I love Destiny’s Child. I was a diehard N’SNYC fan. I was obsessed with JC Chasez. Along with classics, my parents were big fans of MJ and Earth, Wind & Fire. MA: Same with me, my parents listened to soul music growing up. I heard Stevie Wonder and I was drawn in to like “What is this! I have to know. Then I am hearing Michael Jackson pop songs and wondering how he could take three and a half minutes and make it interesting. Not just your average pop song, but also chord changes, the vocals, the beats and the rhythms. Those two really took me in also Ray Charles, of course. CA: I would also say Lauryn hill actually. I use to listen to her stuff. That’s where I got the soul sound. What would you like people to know about the movie, The Book of Life? MA: The film is really about honoring those who have love you and learning how to take that and love those in the future. Carrying on a legacy. The Day of the Dead in Mexican tradition is remembering everybody in the past that has been influential to you in some way. The movie does a beautiful job of take a young love story and using ancestry and playing on what my grandfather did and how he loved. How can it affect me to love this girl? It’s exciting! As you said it adventurous, the colors are beautiful. The animation is state of the art. It’s never been done in that style before. The acting is amazing. There’s humor. There are parts where you want to cry. There’s romance. You feel every emotion when you watch this film. When the movie’s ending. You are inspired. You want to be a better person. You want to love people more. You want to think about the people who have been good to you in the past. That’s what a movie is all about. You should feel emotion and leave changed. That’s what The Book of Life is. CA: We’re excited to be part of it because that’s our mission. Ultimately to do that with our music and leave people inspired to follow their hearts and their passion as well.